I often see articles on topic of how to get massive amounts of followers on twitter. They mostly describe the techniques that are on a thin line between fair use of social media in marketing purposes and unethical spamming. Twitter is a social network before all and there are lots of different people on it with different interests. It’s not really important how many followers you have, it’s all about who your followers are. Let’s say you sell products to interior designers, like our client Pebble Hill Designs does. It would be more important for you to have hundreds of interior designers as your twitter followers then thousands of random folks. It’s pretty simple math, if your followers are people that are really interested into your services / products, you are more likely to convert them into customers and they are also more likely to retweet your messages and engage you into discussions. 1. Define your targeted audience and do some research on them. Find out who are the most influential twitter users among your targeted audience, have a look on what they tweet about and why do people follow them. 2. Use twitter search to find conversations about your niche, services or products. Don’t just search one hashtag and think you’re done. Be creative, try to find any natural order of words that would be used in discussions about your services, products or your general niche. 3. Engage your targeted audience into conversations. This is what social media is all about, conversations. If you manage to give quality info and answer questions about services or products that you also offer, your reputation will grow with time and so will your follower base. 4. Don’t spamm, mass follow, and don’t try to sell your products / services all the time. People don’t like to be sold to. If someone is asking to be recommended a service provider, offer your services, however, don’t just send out spamm to anyone that fits the profile of your targeted audience. 5. Follow the most influential twitter users in your targeted niche and pay extra attention to them. Try to engage them into communication as much as possible. 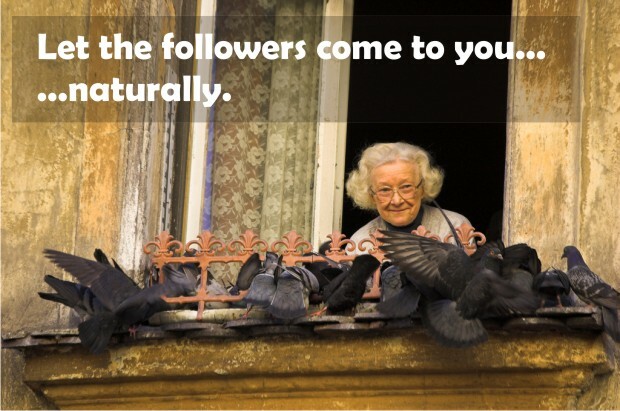 If they communicate with you a lot, you will eventually get lots of followers from them. 6. Use the hashtags in your tweets. It will make your tweets more visible in twitter search and you might get some nice quality targeted followers this way. Once again, don’t abuse these tags, only use them when it’s obvious they fit the context of your tweet. 7. Be active in twitter’s social events such as #FollowFriday. You have to give in order to receive. Hashtag users you find interesting or influential with #FollowFriday tag every Friday and you might be lucky to receive some reciprocal Friday love. This is one of the best ways to get quality and relevant followers on your Twitter account. 8. Join in twitter directories under appropriate category (hashtag). One of the best known twitter directories is WeFollow. If you liked this article, you can follow Inchoo via twitter. Thanks! Very nice article. I just knew that exactly I didn’t need more follower that have no same interest with me, but I need little follower that have the same interest. It’s all about quality not quantity I guess. It basically helps you follow and therefore get followed back by users who have interest in what you tweet about and lets you easily unfollow people who didn’t follow back. I found a nice balance between who to follow, when to follow, and, remove those who aren’t following back, i post a sales item every 2-5 hours with specific text to make it look non spammy. so i guess i can say i treat it like a professional/hobby account, and the reward is just a bonus. great tips. This is a good instructions. I am using some things now. Between the spam on twitter and their crappy web hosting/server speed they have some really pretty serious issues IMO. I like the article and agree with it. Targeted (quality) is for better than quantity. Any suggestions or tips for the best way to go about doing this? All right – finally. An article that doesn’t talk about getting hundreds or thousands of followers. What do you do with them anyway when you do? Great information on keeping your social media manageable. Thanks for sending me the link on twitter at imu. Thanks for this advice. I’m immediately skeptical of anyone who has thousands of followers after having been on Twitter just a short time. All these automated schemes (like the one bertus mentions) really turn me off. I think some people have VERY liberal definitions of what a “targeted follower” means. Don’t fall on these pyramid scheme and similar instant Twitter followers machines like the one mentioned in the comment above. As the matter of fact, never fall on any sort of deal that gets you money while you do nothing. First of all, these followers are worth nothing. They are also in this same program you are, trying to get follower base while doing nothing. This is not your targeted audience, you can’t ahve any benefit from these twitter followers. You have good advice. I do think it is quality not quantity that makes a good follower. I always click on the people that have chosen to follow me. If their bio is interesting then I click on their website link. If I think that I would benefit from following them I do. If they are just those “Get rich quick by becoming an affiliate of this that and everything else, I will probably choose not to follow. I like to use the twitter friend generator to follow and unfollow people on twitter. works great and haven’t had any problems as of yet. Good article with sound advice for Twitters around the world.